The aquaculture industry is the fastest growing food production industry in the world and approximately 50% of all fish consumed by humans is from aquaculture. As aquaculture technology has evolved, the push toward higher yields and faster growth has involved the replacement of natural live foods with prepared diets or supplemental feeding. The main cost factor in aquaculture is the cost of feed. Furthermore, high amounts of feed ingredients from marine sources have been of concern both environmentally and economically. Thus, it is of importance for the aquaculture industry to aim for the development of new locally-produced, cost-effective, beneficent and eco-friendly ingredients for innovative practical feed production. There are more than 35 low price raw materials found locally in Bangladesh can be used in the preparation of supplementary feed of fish and shrimp (Ali and Hoq, 2010). Access to safe, available and economical feed ingredients is becoming one of the most important challenges for strengthening the aquaculture industry and developing a more sustainable production. The major challenges for the industry are to reduce feed cost and environmental footprints without reducing product quality and value. The demand for quality products at low prices ironically forces producers to reduce feed costs by using cheaper ingredients and lower feed specifications (Halteren, et al., 2009). Any prohibited antibiotics, growth hormones, steroids, pesticides or any other hazardous chemicals in the feed or feed ingredients should not be used. Feed contaminants, antinutrients and toxins can dramatically affect the health, growth, and reproduction of fish is being given closer scrutiny in feedstuffs. There are a number of local materials that can be used efficiently in aquafeed production. 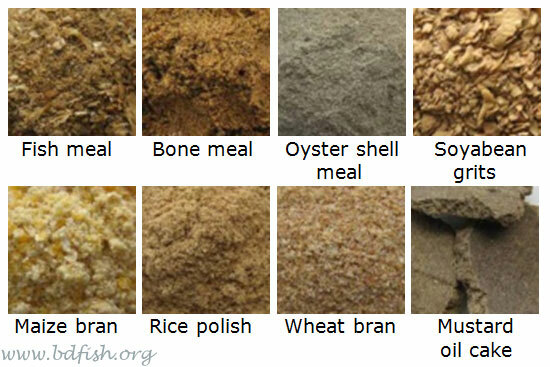 Rice bran, wheat bran, soyabean meal, mustard oil cake, sesame oil cake are widely used. But all these are plant origin materials and in compare to this animal origin materials are in scarce. Locally produced fish meal and dry fish are not of good quality and not available in required amount by the growing number of feed mills. An important point about aquatic feed formulation to consider about what is the best for the fish is not necessarily what the fish eat most readily. There should have good balance of protein, fat, carbohydrate, minerals, and vitamins to ensure the feed efficiency. Excess use of any raw material in feed formulation has adverse effect on the growth of culture species. Proteins found from cereal grains and other plant concentrates do not contain complete amino acid profiles and usually are deficient in the essential amino acids like lysine and methionine. To maintain the nutritional value of the feed presence of least amount of one or several animal origin materials such as Fish Meal and/or meat and bone meal is essential. Most plant-based proteins even when properly processed are usually not as digestible as fishmeal and their inclusion rate into the diet is often limited as it results in depressed growth rates and feed intake. Fish Meal that are produced from specific fish and are harvested just for the purpose to produce fish meal is the best source called as “Whole Fish Meal” or “White Fish Meal”. The nutrients in whole fishmeal also aid in disease resistance by boosting and helping to maintain a healthy functional immune system. Unfortunately, many of the fish feed brands use poor animal origin material or bi-products or low quality Fish Meal which is not complete, as source of nutrition in lieu of the vastly superior whole fish meal. 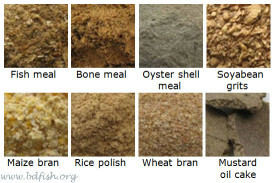 Fishmeal produced from fishery wastes left over parts is rendered from fish offal, trimmings or cuttings, and other wastes principally from filleting and canning operations from the edible fisheries. As good quality fish meal and meat and bone meal are not available in the country that’s why feed producers have to depend on imported meat and bone meal and fish meal and protein concentrate as animal origin material. These imported products contain more calcium, phosphorus specially fiber and are not used more than 30%. Shrimp, crab or other crustacean shells are not used excessively as feed ingredients, since the crustacean shell is likely to contain high levels of nitrofurans, a group of prohibited antibiotics (Dutta, 2011). The fatty acids are the main source of energy in fish, especially for many tissues, such as heart and skeletal muscle. Another important function for fats is for vitamin absorption. Vitamins A, D, E, and K are fat-soluble, meaning they can only be digested, absorbed, and transported in conjunction with fats. The lipids (fats) in fishes can be separated into liquid fish oils and solid fats. This is why fats/lipid for use in fish food is best obtained from aquatic sources such as Whole Fishmeal. Fish lipids are highly digestible by all species of fish (& animals) and are excellent sources of the essential polyunsaturated fatty acids (PUFA) in both the omega-3 and omega-6 families of fatty acids. Fishmeal and oil contain more omega-3, than omega-6 fatty acids. In contrast, most plant lipids contain higher concentrations of omega-6 fatty acids. For example, oil extracted from soybeans, corn, or cottonseed is rich in linoleic acid, an omega-6 fatty acid. As with most animals, it is important to maintain an appropriate balance of omega-3 and omega-6 in the diet, as these two substances work together to promote health. However, too much dietary lipid may result in an imbalance of the energy/protein ratio and in excessive fat deposition in the visceral cavity and tissues, which would adversely affect yield, product quality, and storage. The use of lipids in fish diets also requires the use of appropriate antioxidants. Most of the carbohydrates that enter the aqua-feed are of plant origin. Carnivorous fish, therefore, deal with little carbohydrate. Carbohydrates are not a superior energy source for fish over protein or fat although digestible carbohydrates spare protein for tissue. Also, unlike in mammals, glycogen is not a significant storage depot of energy in fish. The more efficient metabolism of amino acids over carbohydrates (glucose) for energy could be due to the ability of fish to excrete nitrogenous waste as ammonia from their gills without the high cost of energy in converting the waste to urea. In some cases colors are added that may not add any nutritional value (and sometimes may even be detrimental) just to look pretty or attracting to the fish. Some brands of fish feed use colors that are attributed to the actual ingredients in the formula (such as garlic, chili and/or marigold powder, spinach etc.). This method is preferable as it helps to bring out the natural colors in your fish, while keeping them energetic and healthy. Recently with the high demand and increased price of feed ingredients some impurities and adulterations are noticed in the major ingredients. Presence of scrap metals, stones, dirt, saw-dust, kitchen-ash, soil, black oil and some other non-biological contaminants impurities are found on which we should concern about. Quality control of raw materials concerning the exact composition and the levels of toxic substances normally present must be ensured as the specifications are met. These specifications relating to nutrient quality, cost, and the quality desired in the feedstuffs should be determined by a team consisting of the nutritionist, management personnel, and the quality control manager. Ali MZ and Hoq ME, 2010. Improved Fish Feed Management in Aquaculture. Extension Manual No. 38. Bangladesh Fisheries Research Institute, Mymensingh. Dutta UB, 2011. Code of conduct for selected segments of the aquaculture industry in Bangladesh. Ministry of Fisheries and Livestock, Government of Bangladesh. P-20. FAO, 1980. Fish Feed Technology. Report of the FAO/UNDP Training Course in Fish Feed Technology, Held in the University of Washington, Seattle, Washington, U.S.A., 9 Oct.-15 Dec., 1978. Publications Division, Food and Agriculture Organization of the United Nations, Via delle Terme di Caracalla, 00100 Rome, Italy. FAO, 2013. Fish Meal. Torry advisory nore no. 49. Publications Division, Food and Agriculture Organization of the United Nations, Via delle Terme di Caracalla, 00100 Rome, Italy. Halteren A, Phong V, Lam NV, Nguyen HD and Coutteau P, 2009. Optimizing the application of a novel feed additive to improve feed utilization and fillet yield in Pangasius catfish farming. AQUA Culture Asia Pacific Magazine. Thorarinsdottir RI, Jokumsen A, Björnsson BT and Torrissen O, 2011. Local raw materials for production of fish feed for aquaculture. Nordic Innovation Centre – Project no. 10102. Visited 5,870 times, 1 visits today | Have any fisheries relevant question? S/He published 5 features. View All.